What are your plans for Columbus Day Weekend this year? If you want to take part in an incredible fall festival, consider attending the Damariscotta Pumpkinfest. This highly anticipated celebration brings thousands of people together to kick off the autumn season in Midcoast Maine. Explore the streets lined with pumpkin carvings, indulge in seasonal desserts, and watch racers go head to head in pumpkin boats. Scroll down to see how you can join the excitement this year, and don’t forget to request your free Vacation Guide to make the most of your trip. To set the scene for the Damariscotta Pumpkinfest, talented local artists create stunning displays along the streets of the downtown area. They start with dozens of Atlantic Giant Pumpkins, and get to work carving and painting them into remarkable pieces of art. Take a stroll through town and snap pictures with your favorites. Or, feel free to join the team of artists and add your design to the collection. Make sure you bring your appetite this year because there’s always an abundance of delicious treats crafted from the seasonal pumpkin harvest. You can indulge in fresh pies, muffins, pancakes, and more. It wouldn’t be a fall festival without caramel apples, and there are plenty of those, too. If you know of a tasty pumpkin recipe, you’re invited to enter the Pumpkin Dessert Contest and see if you can walk home with a variety of prizes. A favorite among locals and visitors alike, the Giant Pumpkin Parade features creative floats, decorated vehicles, and costumed marchers. Grab a spot along Main Street on Saturday and watch as they all travel past. It’s truly a sight to see. At the Damariscotta Pumpkin Festival, these giant gourds are carved, painted, raced, and eaten. And, for an especially unique event on the Pumpkinfest schedule, they are dropped from a crane stretching 180 feet high. You’re welcome to be in attendance as the pumpkins dive down and crash into junk cars. You can even watch catapults throw them through the air. Afterward, the pieces are collected and recycled as food for local farm animals. On Monday, excited attendees gather in the harbor to cheer on racers participating in the annual Pumpkinboat Regatta. Competitors hollow out giant pumpkins and either attach motors or use paddles to reach the finish line. If you want to relax in the shade but still catch the action, head over to the Lincoln Theater and watch it via a live stream. Stay Nearby at the Topside Inn to Experience It All! If you need a place to stay so you can enjoy the full weekend of excitement, we invite you to join us in Boothbay Harbor at the Topside Inn. Breathtaking views, coastal-themed rooms, and fresh gourmet breakfasts are just a few of the things you can enjoy here. We even feature local artwork along our walls to create an inviting atmosphere for relaxing getaways. Among our list of top-notch accommodations is Room 24. When you walk inside, you can find a luxurious king-size bed, vaulted ceilings, and an outdoor sitting porch. Since it’s on the top floor of our Leeward Guest House, you can also enjoy unmatched views of the harbor. 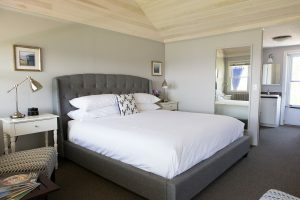 Book your stay today and prepare yourself for the ultimate vacation in Midcoast Maine. We look forward to welcoming you to the area.